The Indianapolis Colts has announced the hiring of Frank Reich as the 20th head coach in franchise history. "We are extremely excited to announce Frank Reich as head coach of the Indianapolis Colts,” said Colts owner & CEO Jim Irsay. “Frank has all the ingredients of a successful head coach: intelligence, innovation, character, organizational and leadership skills, and a commanding presence. He also has a stellar reputation, and his myriad of life experiences and the people he has worked with make him the perfect fit for us and our fans. I feel extremely fortunate and could not be more excited for Colts Nation and the future of our franchise." Reich is expected to be formally introduced in a Tuesday press conference. Reich, 56, was most recently the offensive coordinator for the Philadelphia Eagles, who last Sunday defeated the New England Patriots, 41-33, in Super Bowl LII in Minneapolis. Reich actually got his start in NFL coaching with the Colts, where he started as an intern in 2006 and began to work his way up. After two seasons, he was promoted to be an offensive assistant, and by 2009, he was Indy’s quarterbacks coach. Reich, of course, worked with Peyton Manning those two seasons in what were arguably his best-individual years with the Colts. In 2009, Manning claimed league MVP honors after completing 393-of-571 passes for 4,500 yards and 33 touchdowns; his 68.8 completion percentage was a career-best. The next season, Manning would log a then-career-high 4,700 passing yards. In 2011, Reich served as the Colts’ wide receivers coach, and despite missing Manning the entire season due to injury — and despite playing with three different starting quarterbacks — Reggie Wayne and Pierre Garçon that year were just one of two wide receiver duos in the NFL to each record 70-plus receptions and 900-plus receiving yards. Reich then moved on to become the wide receivers coach for the Arizona Cardinals in 2012, working with the likes of Larry Fitzgerald and Michael Floyd, before making another move to the San Diego Chargers to be their quarterbacks coach the following season. In 2014, Reich began a two-year stint as the Chargers’ offensive coordinator. Working closely with Philip Rivers from 2013-15, the quarterback would throw for a combined 13,556 yards — the third-most in the NFL during that span — as well as 92 touchdowns (fourth most), with 1,194 completions (third most) and a 67.3 completion percentage (second best). Reich was hired by head coach Doug Pederson to be his offensive coordinator in Philadelphia during the 2016 offseason. Reich would be entrusted with the development of quarterback Carson Wentz, the No. 2-overall pick in the 2016 NFL Draft, and the North Dakota State product quickly showed why he was such a highly-regarded prospect. After trading Sam Bradford to the Minnesota Vikings just before the start of the season, Wentz was named the starter heading into Week 1, when he would throw for 278 yards and two touchdowns in a 29-10 victory over the Cleveland Browns, earning NFL Rookie of the Week honors. Wentz, who was named the NFL’s Offensive Rookie of the Month in September, would go on to break the NFL record for completions by a rookie quarterback (379), also setting a single-season franchise record, and finished his first season with 3,782 passing yards with 16 touchdowns to 14 interceptions, while also running for two scores. Reich and the Philadelphia offense then took off in 2017. Wentz, an MVP candidate for most of the season before suffering a torn ACL Week 14 against the Los Angeles Rams, finished his season completing 265-of-440 passes for 3,296 yards with 33 touchdowns to just seven interceptions, and was named to his first Pro Bowl. Backup Nick Foles took over from there, and would go on to lead the team to its first-ever Super Bowl title, completing 28-of-43 passes for 373 yards with three passing touchdowns and one pick, while also catching a touchdown in the Eagles’ victory over the Patriots. 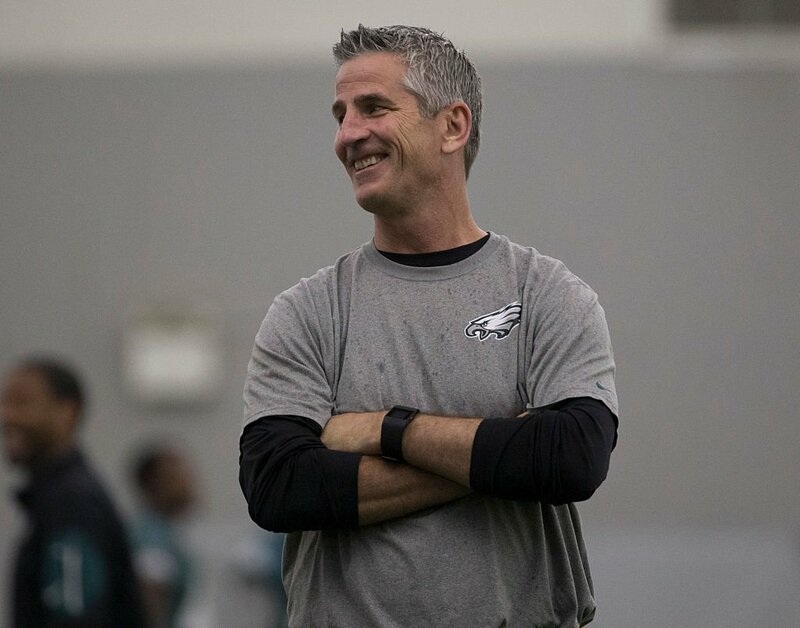 Under Reich, the Eagles in 2017 ranked seventh in the league in total offense, fourth in first downs, first in passing touchdowns and third in rushing yards. Reich also had previous ties to former Colts general manager Bill Polian prior to his coaching stint in Indy. A quarterback out of Maryland, Reich was the Buffalo Bills’ third-round pick in the 1985 NFL Draft, where Polian was the Pro Personnel Director and would take over as general manager the next season. Reich would become the popular backup to future Hall of Famer Jim Kelly, and filled in admirably in several key games when Kelly went down with injury. His most famous performance came during the Bills’ Wild Card Round matchup against the Houston Oilers Jan. 3, 1993, when Reich led Buffalo on a 38-3 run to overcome a 35-3 third quarter deficit to advance to the divisional round. The 32-point swing was the largest comeback in NFL history. Reich would later join the Carolina Panthers, where he threw the first touchdown pass in franchise history to Pete Metzelaars in the 1995 season. In 13 NFL seasons, Reich would play in 118 games with 20 starts, completing 508-of-932 passes for 6,075 yards with 40 touchdowns to 36 interceptions.